Today we are going to install a custom, CA-signed certificate for our new instance of vROps. VMware published information about the certificate requirements (in short: .pem file, full certificate chain required), as well as a procedure to update the certificate. However this procedure is limited (it does not configure the certificate, for instance), so we are going to develop this part a little bit. As in previous articles, we are using a Microsoft-based certificate authority. This entry was posted in VMware and tagged Certificates, vROps on 20 February 2015 by Fried. 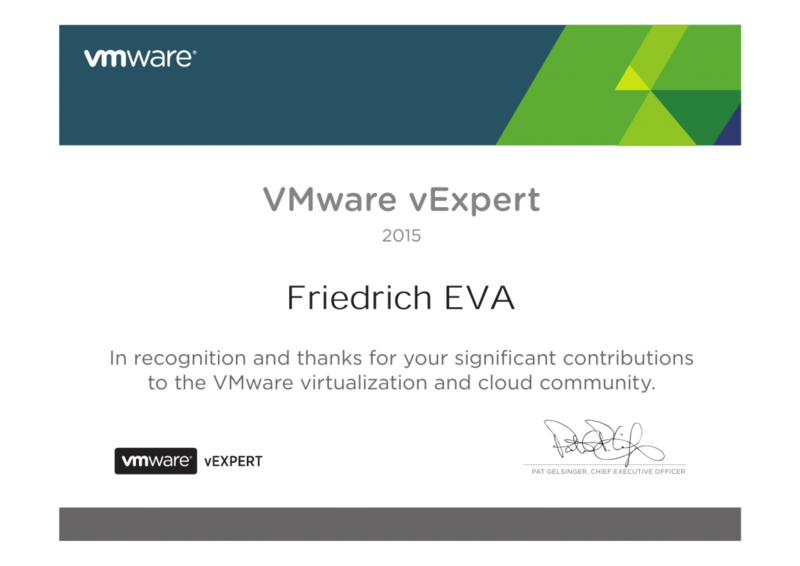 I learned this morning that I was just awarded the vExpert title! I submitted last year without really knowing what was behind the vExpert program. Now that I see the big picture, I’m impressed by all the content, the community (… the license keys 🙂 ). That’s a great feeling and I’m proud to join the team! This entry was posted in Non classé on 12 February 2015 by Fried. In our article series about vSphere Replication, we configured new replications and checked the possibilities for monitoring these replications. These monitoring possibilities are interesting when you create a new replication, or when you’re in a troubleshooting session. But on the long run, this is not an efficient way to monitor ongoing replications. In this article we will create an alarm to send us an email when the RPO of a replication is violated. This entry was posted in VMware and tagged vSphere Replication on 12 January 2015 by Fried.